There are many wounds to our unity as Christians, and this is even true among those who are in full and visible communion with each other. I’ve mentioned instances of this in the past, but do not consider dwelling on our weaknesses to be any sort of strength. In this post, I’d like to consider one small way in which we as Western and Eastern Christians are succeeding in loving each other through understanding one another, in a way that many may have overlooked. I was reading the Catechism of the Catholic Church to help prepare myself to teach a Sunday School class, when a wonderful observation came my way. 732 On that day, the Holy Trinity is fully revealed. Since that day, the Kingdom announced by Christ has been open to those who believe in him: in the humility of the flesh and in faith, they already share in the communion of the Holy Trinity. 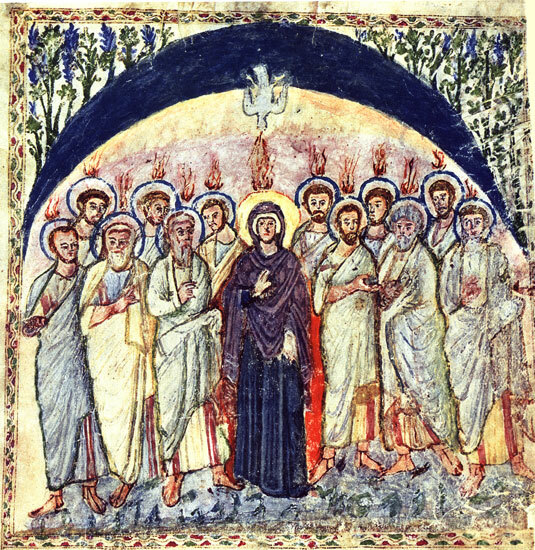 By his coming, which never ceases, the Holy Spirit causes the world to enter into the “last days,” the time of the Church, the Kingdom already inherited though not yet consummated. Those of us who are Eastern Christians will immediately recognize the italicized text quite well-we sing it after most Divine Liturgies, just after receiving the Eternal God through the Divine Eucharist. But to see a pan-Catholic Catechism quoting from our life of prayer almost nonchalantly, this was marvelous to consider. It is as if the authors of the Catechism were saying, “We want you to understand the importance of what we’re quoting, so please learn the Byzantine Liturgy, and feel its truth as we quote it to you.” It is a call to breathe with both lungs! To such a proposition I can only say, “Thank You.” And I also would hope that we who know these words as part of our own soul would reach out to share its beauty and truth with all who have ears to hear. On January 28th, we commemorate our Venerable Fathers Ephrem the Syrian and Isaac the Syrian. Much could be said about both of these Fathers, but I would like to focus on one of them today. Of the many comments and titles that Saint Ephrem has received through the centuries, Harp of the Spirit is most dear to me. It speaks of two beautiful pictures. 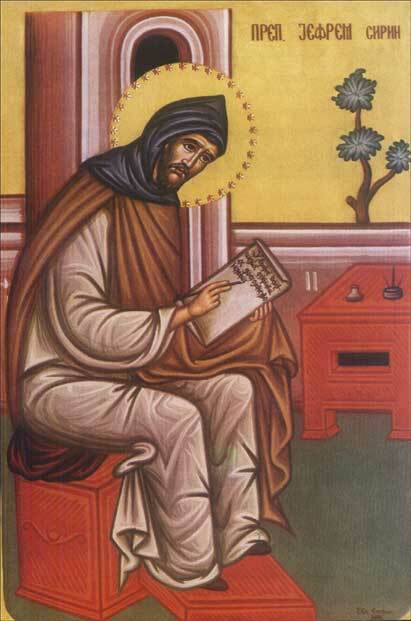 On the one hand, Saint Ephrem’s beautiful hymnography is a harp in the sense that he was a docile servant of the Lord, who allowed his whole life to be an instrument in the hands of God. On the other hand, being a Harp of the Spirit, what was wrought by Saint Ephrem was pure beauty and truth of the Spirit-he was a source of music in the pure sense of being that which muses our whole being on God. His Lenten Hymn/Prayer, which is this blog’s namesake, testifies wonderfully to how much Saint Ephrem could write for the glory and praise of the ineffable God. Here are a few more quotations from him on his feast day, compiled via the Holy Fathers Facebook page (which is worth adding, if you are a Facebook user). Venerable Father Ephrem, Pray to God for Us! Recently, a good friend of mine lent me a copy of the new documentary series by Fr. Robert Barron which is entitled ‘Catholicism’. Despite being a fan of much of what Fr. Robert Barron is doing and saying in our modern world, I offer this critique with regard to a key aspect of this epic series. At the outset, I must also say that while these episodes are wonderful, with nearly ten hours of gripping narratives, beautiful visuals, and a broad story about the truth of the Catholic Church, there is a gaping hole in the whole narrative that could leave a bad taste in the mouths of those of us who are Catholic but not Roman Catholic. Other than capturing beeswax candles and icons onto film, the narrative, hagiography, and theological perspectives in the ‘Catholicism’ series is written from a Roman Catholic perspective. One could watch all ten hours and never know that over 10 million Catholics aren’t Roman Catholic-we pray differently, think differently, and yet love our Western Brethren and our Catholic faith, all coming from a unique lens and way of life. As an Eastern Catholic, none of this is to say that the Roman Catholic perspective is wrong or bad. We are, in fact, in full communion with Roman Catholics, and we see much that is complimentary to our own perspective and patrimony in the West. But it is certainly not catholic to be only Roman Catholic, in the sense that catholic means “kata holos”; i.e., according to the whole. 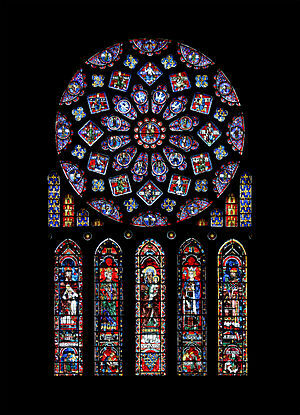 The Church is a communion of Churches, with their own culture, patrimony, liturgy, style, art, theology, and perspectives. To make a video on Catholicism and not reflect this even by way of saying, “The Church is even bigger than being Roman Catholic, as there are other Catholics out there who aren’t even Western Christians”, is to sell short the breadth, depth and catholicity of what it means to be Catholic. The whole of Catholicism is not found in a full orbed understanding of the West, just as much as it is not a matter of only understanding the East. Instead, Catholicism should be a grasping of the whole Christian community. Unfortunately, the 10 episodes in the ‘Catholicism’ series do not mention how Eastern Christians pray, or that we even exist. Again, there is the intro scene that shows beeswax candles, but our way of prayer, our saints, and our very existence are sadly not mentioned. For these reasons, I would have much preferred that this beautiful series be renamed ‘Roman Catholicism’, as the viewer will spend ten hours and not learn about any Catholicism other than that of the Latin Rite. This may be a beautiful rite, and it may be the Ritual Church of the Pope of Rome himself, but it is not Catholic to solely focus on the Latin Rite. After all, 22 other particular Churches in the one Catholic Church are simply not Latin. We have a Light of the East (cf. Orientale Lumen), and it would have been wonderful to see it portrayed in a DVD series on Catholicism. Because it was not portrayed or even mentioned in the ‘Catholicism’ DVD series, I would much rather have preferred to watch this series under the qualified title of ‘Roman Catholicism’. With all of this being said, I would still recommend the series to people, especially if one understands where it is coming from in its depiction of the Catholic faith. But if Fr. Robert Barron were to ask me for a word of advice for a bonus episode, I would unhesitatingly offer the criticisms above, not in a spirit of bitterness but in a spirit of admiration for his ability to tell a wonderful story, which currently stands somewhat incomplete. May God help us all to grow in a mutual understanding and appreciation of each other, and may He unite those of us who are not in full communion with each other. Please follow this link for some reflections on the annual week of Christian Unity, put forth by the Vatican. I found the reference to the Orthodox concept of the “liturgy after the liturgy” to be especially helpful in putting these thoughts down on Called to Communion. After meeting at a conference center in El Segundo on Friday night and Saturday, the Sunday portion of the Eastern Catholic Encounter West Coast was held at St. Andrew’s Russian Catholic Church in El Segundo. 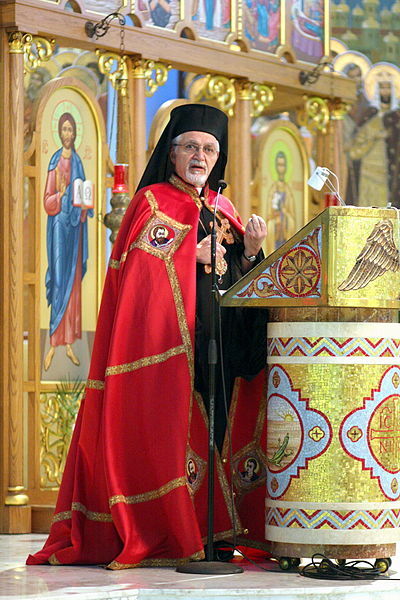 There, Bishop Nicholas Samra of the Melkite Eparchy of Newton gave the final talk. I was blessed to participate in the liturgy presided over by my own Bishop, His Grace Bishop Gerald of the Holy Protection of Mary Byzantine Catholic Eparchy of Phoenix, and you can see one photo from the liturgy above. We had a wonderful liturgy and agape meal together, and we then reconvened for Sayedna Nicholas’ talk. Who are we as church leaders? This question is not answered by producing a spiritual “org chart”-instead, we believe that holy orders serve to serve all people. Without the people, ministry has no meaning. Who is being ministered to, otherwise? Ministry is a servanthood, and we have to have someone to serve as ordained and lay leaders. We are part of the priesthood as other Christs, even as lay people who are leaders in the Church. Instead of seeing lay people versus the ordained as those in contrast, the ministerial priesthood that is unique to Holy Orders and Royal Priesthood which is from our common Baptism work together, hand in hand. To truly be Together in Christ, we must embrace this synergy between all Christians. Paul is sometimes an architect, planting churches. Paul is sometimes a contractor, passing ministry on for others to exercise leadership in those Churches. Paul was also a carpenter, doing the actual baptisms and preaching. Leadership is connected to being in the image and likeness of God, and we all play our part as different members in the Body of Christ. Not all of us will be as St. Paul, who built up the Church in such diverse ways. But if we are living in accordance to our calling to serve the Body of Christ, we will build up the one building that is the Church. The last point that I wanted to emphasize in Bishop Nicholas’ talk was his reflections on the future of Eastern Catholic Churches in America. We came together, he said, but if it ended on that day, it would lead to little fruit. Long range planning is discerning strengths for the future. We have to ask what our strengths are so that we can expand and build on strengths. For example, if our parish has good liturgy/cantoring, we must be faithful to sharing videos, recording music, and the like. In essence, we must use our strengths to build up God’s vision. On a practical note, Sayedna encouraged us all to take our excitement home and continue to consider how we can do things together. The weekend can’t end, we need to follow up. One text which was recommended to think about the importance of this was Fr. Anthony Coniaris’ book-The Eye Cannot Say to the Hand. I can testify from having read it that this is a wonderful work which shows the need that we have for each other, which runs so contrary to the individualism of our day. He also recommended that we consult supplementary readings on the Eastern Catholic Encounter Website. If I’m following the website correctly, the link is here. He then encouraged those of us who live near Eastern Catholics of other jurisdictions to get our communities together, planning to move forward, trying to get resources to build each other up. In closing, I think this last point makes for a good reflection on ways Bishop Nicholas’ talk could be improved. Mostly, the improvement for which I hope can be found through all of us who have yet to live out this vision laid out in the talk. I do not feel that this follow up is actually happening on a large scale-perhaps this is only a matter of impatience or blindness on my part, but I sincerely hope that this vision can be truly lived out by all of us, so that the Body of Christ may be built up more and more. Ok, if you haven’t figured it out even before reading this post, I must confess that St. Theophan the Recluse did not have a Facebook account. He lived on this earth from 1815 to 1894, and we believe that he now intercedes for us from heaven. Nevertheless, I have recently become acquainted with some of St. Theophan’s writings, and have found his heart to speak with much clarity to our own day, as it relates to modern technology such as Facebook. In his work The Path to Salvation, St. Theophan discusses a general sketch for what is needed to both grow into a mature Christian, and to also raise children along the same path of maturity which we should all be seeking. He goes on to clarify how true investigation and learning differ from curiosity, and offers sound advice on how to master our passions and imagination so that we may live (and think!) according to the truth. “Investigation is already inevitably curiosity. Curiosity consists of trying to know everything without order, without aim, without distinguishing whether it is needful or not. It is only necessary that one should preserve a measure and order in exercising the senses, and direct them only to what is needful and to awareness of what is needful-then there will be no food for curiosity. That is, one must train the child to investigate what is considered to be essential for him, but to refrain from and avoid everything else. Then, in the very act of investigating, one should preserve a progressive order-not jumping from subject to subject, or from one feature to another, but looking at one thing after another and taking care afterwards to picture the subject in the mind in a fitting way. As I read and reread these words, I am struck by their application to our own society. We are overcome by curiosity and exhausted from chasing one subject after the next. Now, I cannot be certain of what St. Theophan would say about Facebook and other technological “advances” that we have had. However, I can say that his diagnosis of how curiosity weakens one’s focus and attention is quite in keeping with my own experience as a human being, and with my observation of the world in general. We see so many times where people are completely up to date with every latest fact about the world through Facebook and the like, but how to make sense of the world and the facts about it seems to be completely beyond our means. Many times, people do not even believe or aspire to make sense of life for that matter! And perhaps it is because of what St. Theophan states–perhaps we are exhausted by the barrage of facts and pictures and images conceived by our own imaginations, to the point where how they are connected one to another is bewildering and overwhelming. We miss more than the forest for the trees, we end up missing everything out of an inordinate curiosity about things. We cannot investigate anything in truth because our curiosity has given us so many random images and thoughts that are not interconnected. We are overwhelmed and weakened through such an overload of curiosity. Through St. Theophan’s prayers and his advice, may we overcome this dominance of curiosity. May true investigation never cease, but may our obsession with the latest and the greatest images die down in our hearts. In its place, may the love of the truth as a Person and a consistent Message to us from Him and His world reign and flourish in our lives. Holy Father Theophan, Pray to God for Us!